Eye Magazine | Blog | Freeze! Why ‘existential’? 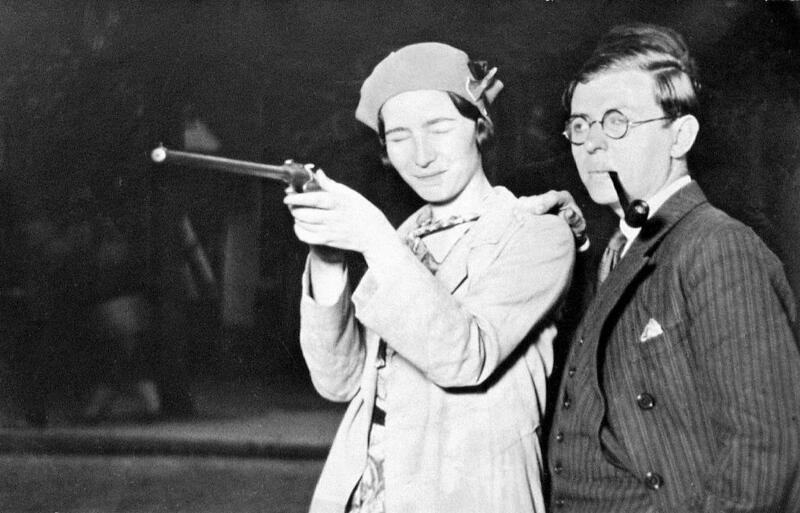 Well, the show does feature an image of Simone de Beauvoir (above, with Jean-Paul Sartre) shooting off a round with her eyes shut. And, it could be argued, this photographic novelty freeze-frames the very moment of existence. Neat! The curator, Clément Chéroux of Centre Pompidou’s Photography Department, explains his fascination with the shooting booth: ‘Twenty years ago I found a photograph in a box [now the first image in the show], but I couldn’t work out how the image was taken.’ Chéroux was puzzled by the ‘cinematic lighting’ and the look on the guy’s face: a mix of concentration, pleasure and anticipation. Then, in Michel Butor’s L’emploi du temps (Passing Time, 1956) he read a description of a shooting booth. Jean-François Lecourt. 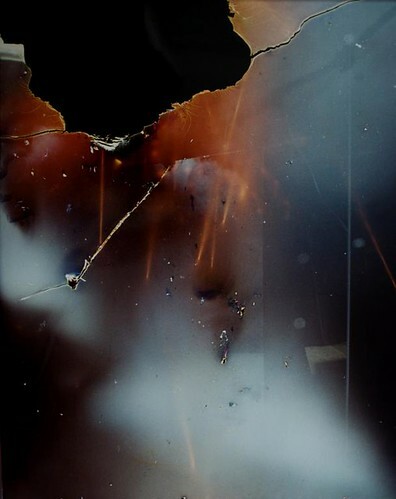 Shot into the camera, 1987 C-type print, 180 x 125 cm © Jean-François Lecourt. Collection of the artist. Courtesy of The Photographers’ Gallery. The booths were popular after the First World War, when returning soldiers were eager to show-off their marksmanship and the cost of portrait photography was still prohibitively expensive; the booths were common in Europe until the 1970s, with a few still doing the rounds in Germany and Belgium. But this show doesn’t simply chart the decline of an arcane amusement. Links abound, between portraiture, instant entertainment, the camera, the gun, and the idea of creating or obliterating ‘the self’. So do metaphors – portraits and guns are both ‘shot’. The breadth and depth of Chéroux’s material mean that it avoids quirky superficiality; this is more than just a fairground ride. Mixing what Val Williams (see ‘Lost worlds’ in Eye 55) defines as ‘authored’ and ‘vernacular’ images, Chéroux shows how artists and photographers are influenced by various genres of photographic image; as well as the output of shooting booths, there are hints of street and war photography, the commercial studio and the cinematic ‘shoot-out’. 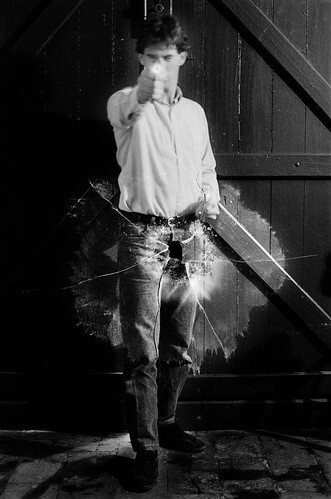 Christian Marclay, Crossfire (2007). Still from audio-visual installation on four screens. Courtesy of the artist, White Cube and The Photographers’ Gallery. Top: Simone de Beauvoir, Jean-Paul Sartre Photo-shot, fairground at Porte d’Orléans, Paris, June 1929 © Jazz Editions / Gamma / Gamma-Rapho. Courtesy of The Photographers’ Gallery. 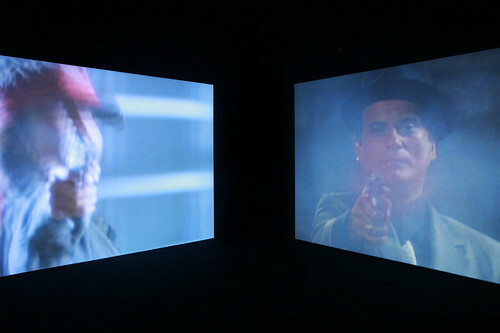 A high point for me was Christian Marclay’s Crossfire (2007), an immersive audio-visual, four-screen installation; as movie heroes mow you down from all sides the noise is intense. Since 2005 Sylvia Ballhause has investigated shooting booths, initially inspired by a magazine commission; using both found and staged photos she questions the violence inherent in all photographic imagery. 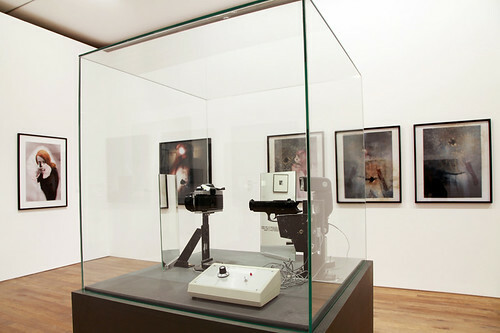 Steven Pippin, 35mm Pentax camera shot in the side, Auto-portrait with two mirrors, 2010 C-type print on di-bond, 60 x 80 cm. Courtesy of the artist and The Photographers’ Gallery. Erik Kessels’ series of 64 prints, In Almost Every Picture (2008-2010), charts one woman’s fascination with the shooting booth at her biannual local carnival, from 1936 until now. The project records changes in Ria van Dijk’s appearance, in the fashions of the day, and in film technology; what remains the same is her sheer enjoyment of the process and her obvious sharpshooting skills. 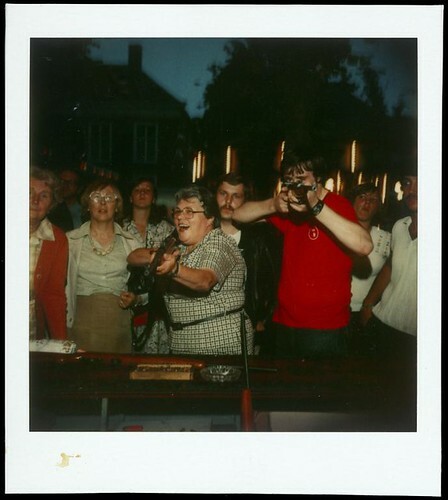 Right and thumbnail: Ria van Dijk, Photo-shot, Oosterhout, Netherlands, 1978, Polaroid, 10.8 x 8.8cm. © Erik Kessels. Courtesy Stedelijk Museum, Amsterdam. Courtesy of The Photographers’ Gallery. At Shoot!’s first outing, at Les Recontres Arles Photographie in 2010, the headline guest, Mick Jagger, cancelled; but Ria van Dijk agreed to appear ‘… and became the real pop star of the festival,’ Chéroux recalls. The popularity of a ‘real-life’ celebrity demonstrates our fascination with such vernacular moments. But the re-presenting of Ria van Dijk by Erik Kessels shows how these days artists and photographers might edit our interaction with the ‘real’, adding a little extra magic as they do. The Photographer’s Gallery, 16-18 Ramillies Street, London W1F 7LW. Photographers’ Gallery installation photograph by Kate Elliott.